Several years ago, I wrote book review for Charles Murray’s Coming Apart: The State of White America, 1960-2010, which chronicles how our society is stratifying into an educated elite vs. everyone else. 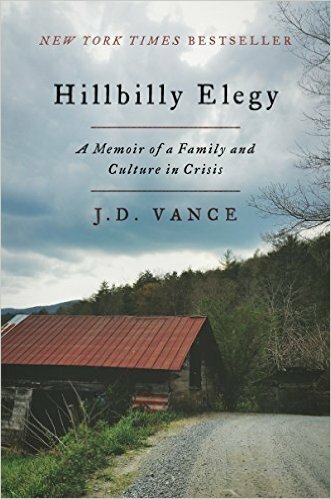 Hillbilly Elegy: A Memoir of a Family and Culture in Crisis by debut author J.D. Vance, is a good companion book to that one. My interest was piqued when I read several reviews (including criticisms from both the left and the right) and then spoke to someone who’d read (and liked) it. I decided I needed to try it for myself. Vance is a young man to be writing a memoir—only 31 at the time. He begins by outlining his grandparents’ story. Bonnie Blanton was 14 and pregnant when she eloped with 17-year-old Jim Vance. They decided to leave the family homestead in a Kentucky “holler” and head north to the industrial towns of Ohio. The young couple lost that baby, but they later had three more children, a boy and two girls. Ohio might be just across the river from Kentucky, but Appalachian honor culture was a world away from the orderly, and rather boring, suburbs of the 1950’s. Separated from all that was familiar, the family started to spiral down into alcohol abuse and marital infidelity. Vance’s mother never recovered from the increasing dysfunction, and her own adulthood became a revolving door of boyfriends and husbands. The only truly consistent person in Vance’s life was with his grandmother, and by the time he was in high school, he lived with her. After high school, he joined the military and served in Iraq. The Marines were the making of Vance, teaching the discipline that had been lacking in his family life. After getting out, he went to Ohio State and then was one of the few graduates of a public university accepted into Yale Law School. · Poverty is as much a state of mind as a number. At one point in Vance’s youth, his mother and her husband/boyfriend/man-of-the-moment pulled down a six-figure household income. And yet, they had nothing to show for it because they spent the money frivolously rather than acquiring savings or assets. · If you are poor (or just have the mentality of the poor), it is very difficult to pull yourself out. The people around you tend to be people with the same mindset, and there is no one to show you a different way. Simple things, like college applications or college financial aid, are complicated to those who have no assistance or guidance. · As people become convinced the deck is stacked against them, they give up trying. Vance wrote about the difficulty companies have finding unskilled workers who will actually work. One example was a young man with a baby who landed a good paying job for one with his (lack of) skills. One would think he would be thrilled with the chance to earn a decent income, but not having learned discipline, he was so unreliable his employer eventually fired him. Reading this book caused me to ponder my own family background. At one point, my ancestors suffered from the same destructive forces as Vance’s. 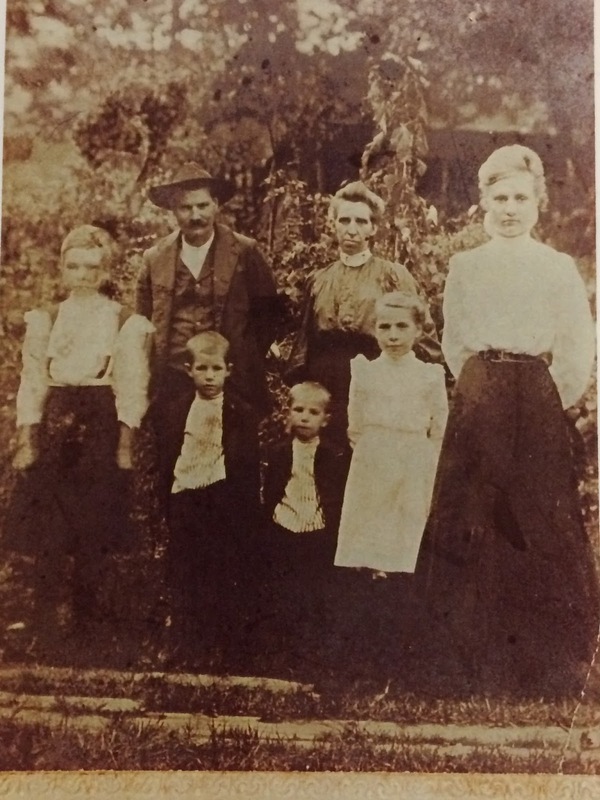 My great-grandfather grew up in Appalachia, the illiterate son of an alcoholic, but he changed the trajectory of his life and his descendants’ lives. Unlike his father, he worked hard, married a fine woman, and made certain his children received educations. 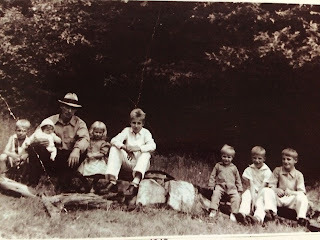 Even though my grandfather stayed in Reese Hollow to take over the family farm (his siblings left to become teachers and a minister), he too worked hard and married well. 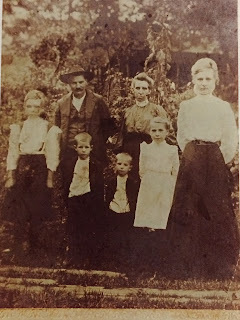 My g-grandparents with their five (surviving) children. My grandfather is the little guy in front. My mother grew up on that same farm, the seventh of my grandparent’s ten children. Like Vance’s grandparents, she left home at 18 for the big city (Chicago, in her case) during the great migration. But she had a high school diploma, a strong faith, and a supportive family to sustain her. 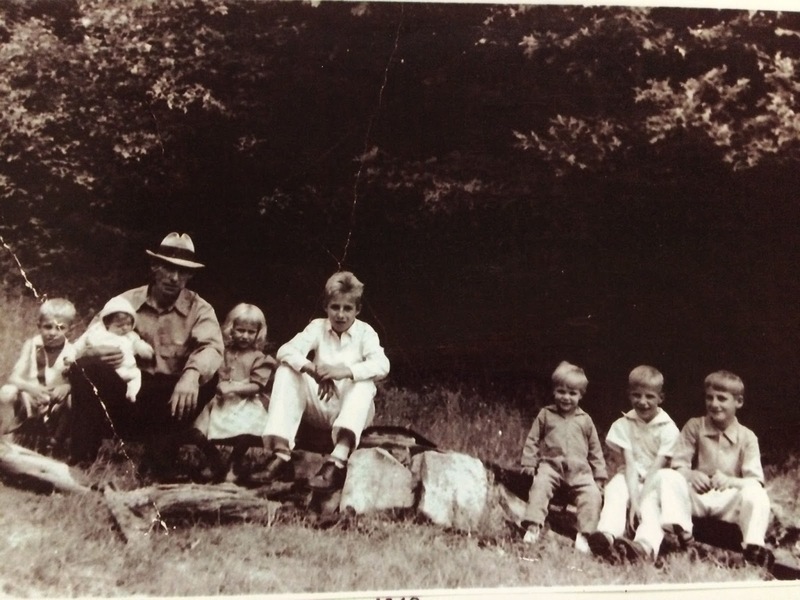 My grandfather with the oldest 7 of his 10 children. My mom is the baby on his lap. Hillbilly Elegy is a good first step toward bringing understanding to a part of the country that has been in decline. The problems of the Vance family are found across much of the now de-industrialized Rust Belt where hopelessness has set in. What is to be done? There are no easy answers. The problems are as much spiritual ones as financial or educational ones. I think Hillbilly Elegy would make a very good book for church reading groups. Perhaps it will spur Christians to mission work right here on the home front. That sounds fascinating, and so sad. We were never rich, and frankly I don't know how my parents managed to stretch my dad's salary they way they did, but we were always told we could do anything we set our minds to, and we were always afforded a good education and the importance of education and responsibility were always stressed. It must be really, really hard to accomplish anything without that kind of family support. It's a very difficult problem. Yes, it really does point to the importance of a stable family to give kids the tools to do well in life. Spiritual poverty is more devastating than financial poverty. years ago, a friend and I saw an exhibition at the Smithsonian on Appalachian Women. It was all black and white photos but my friend and I basically cried through the whole exhibit. There was so much emotion and strength and grit in the faces of those families that you couldn't help but be touched by it. I have some of this history as well and I learned about how people lived in poverty by visiting family in Western PA, (Who were much better off than some of their neighbors.) While some stereotypes and pure red-neckedness runs deep, these families are an incredible insight into our history and where they came from as well. Thanks C.J.! interesting book!